At Google, we spend a lot of time each day working with code. 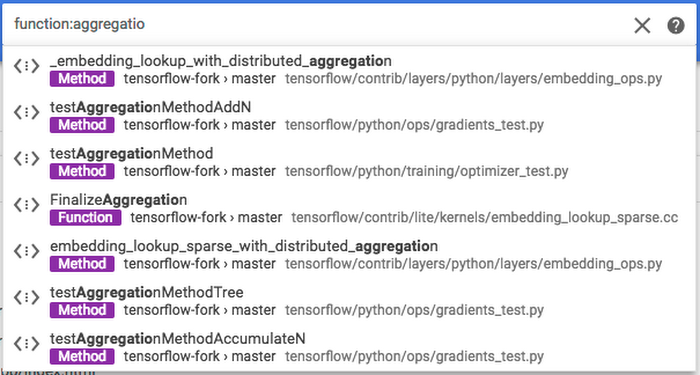 As Google has grown and the code base has increased in complexity, Google engineers have built a set of code tools to help our developers stay happy and productive each day. One particularly essential tool is code search, which is well-loved by Google engineers, and used by most engineers here multiple times a day to improve their productivity. We’re pleased to bring code search to you with the newly revamped Cloud Source Repositories in beta availability. It features an entirely new user interface and semantic code search capabilities. Cloud Source Repositories is powered by the same underlying code search infrastructure that Google engineers perform their code searches on every day. You get super fast results and save a lot of time finding that piece of code that you know you’ve seen before. The code search in Cloud Source Repositories uses the same document indexing and retrieval technologies that are used for Google Search, making it work very quickly. Using this code search can improve developer productivity, whether you host your code in Cloud Source Repositories or mirror your code from the cloud versions of GitHub or Bitbucket. As developers ourselves, we know how frequently we need to search code. One developer case study found that programmers conduct an average of five search sessions with 12 total queries each workday. and how to perform a task. There are some common code search challenges we’ve encountered. Here are a few of those, along with how Cloud Source Repositories handles them. You want to search across all the code at your company, but there are a lot of repositories with only a few stored locally—which aren’t up-to-date with the versions on the server. Storing code locally isn’t a great option, and your computer’s search tools aren’t very powerful. When you’re using Cloud Source Repositories, the default branches of all repositories are always indexed and up-to-date. It’s simpler and faster to search across all the code you have access to for a particular file/class/function, rather than hunting for the code you have stored locally. You’re looking for code that performs a common operation that is used by other people in the company. With Cloud Source Repositories, you can do a quick search and find that code. By discovering and using the existing solution rather than reinventing a new solution, you’ll save time, avoid introducing bugs and keep a healthier code base by not adding unnecessary code that has to be maintained over time. You don’t remember the right way to use a common code component like an event handler. With Cloud Source Repositories, you can enter a query and search across all of your company’s code for examples of how that event handler has been used successfully by other developers. You can write the code correctly the first time. You discover an issue with your production application. It reports a specific error message to the server logs that reads “User ID 2503295 not found in PaymentDatabase.” You can perform a regular expression search for “User ID . * not found in PaymentDatabase” and instantly find the location in the code where this error was triggered. Then you can get a fix deployed to production for users. Rich regular expression matching allows an easy way to find usages, definitions and sample code, and helps for refactoring. Bringing Google’s code search capabilities to Cloud Source Repositories means you’ll get the benefits of Google Search technology for your code base searches. One key benefit is that now all owned repositories that are either mirrored or added to Cloud Source Repositories can be searched in a single query. This works whether you have a small weekend project or a code base the size of Google’s. And it’s fast: You’ll get the answers you need super quickly—much faster than previous functionality—so you can get back to writing code. And indexing is super fast, too, so the time between new code being added and being available means you’re always searching up-to-date code. Cloud Source Repositories respects all identity and access management (IAM) permissions, so users won’t see any code in search that they shouldn’t have access to, and there are no additional permissions to set up. Learn more about searching through your code in Cloud Source Repositories. Code search in Cloud Source Repositories uses the same search technologies as Google Search, but optimizes the indexing, algorithms, and result types for searching code. When you submit a query, that query is sent to a root machine and sharded to hundreds of leaf machines. It looks for matches by file names, classes, functions and other symbols, and matches the context and namespace of the symbols. If regular expressions are specified in that query, our code search runs an optimized algorithm to quickly find potential matches for the regular expression. Then, it refines results against the full regular expression to find the actual matches, so the code search can match complex regular expressions very quickly. In addition, Google’s code search looks for relevant snippets of the code around the search to provide additional context for the code match. If you haven’t used Cloud Source Repositories before, you can try it today at no cost with the Google Cloud Platform (GCP) free trial and our generous free tier. When you navigate to Cloud Source Repositories, you’ll see a signup page that will guide you to add your code. You can create a new empty repository or mirror your code from the cloud version of GitHub or Bitbucket. You can easily populate new empty repositories by pushing code from a local machine or writing new code without leaving the browser using the Cloud Shell editor. If you have existing code stored in Cloud Source Repositories, you’ll be greeted with a new personalized landing page, shown below, that presents a view of all of the repositories you can access across all of your GCP projects. Over time, your personalized landing page will become populated with the recent code you’ve browsed and areas of the code base you’ve favorited. We’re continually working hard to bring you tools that will help your developer team be happy and productive. Give the new Cloud Source Repositories beta a try and let us know what you think using the in-product feedback tool. We’ll look forward to hearing from you.